[PDF] Foundations of GMAT Math, 5th Edition (Manhattan GMAT Preparation Guide: Foundations of Math) | Free eBooks Download - EBOOKEE! Description: Manhattan GMAT's Foundations of Math book provides a refresher of the basic math concepts tested on the GMAT. Designed to be user-friendly for all students, this book provides easy-to-follow explanations of fundamental math concepts and step-by-step application of these concepts to example problems. 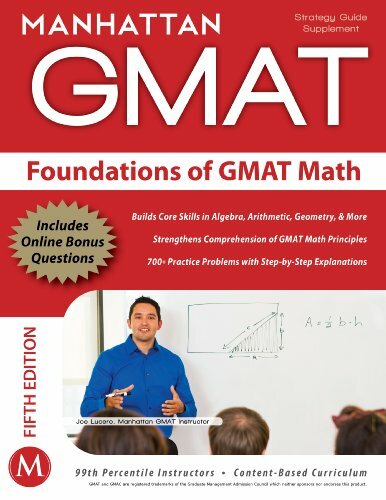 With nine chapters and over 600 practice problems, this book is an invaluable resource to any student who wants to cement their understanding and build their basic math skills for the GMAT. No comments for "[PDF] Foundations of GMAT Math, 5th Edition (Manhattan GMAT Preparation Guide: Foundations of Math)".